Just wanted to share this. I recently purchased this medallion, it seems in pretty good shape. I saw these being used on Mustangs, but were they also used on early Cobras? Very nice, it even has both pins. Usually one or both pins are missing. Based on original owner reports and pictures some early Mustangs got dealer installed COBRA something kits that included 2 each of this version of mascot emblem. Based on emblems found included in kits, over time there were three different mascot emblem designs included in COBRA kits. 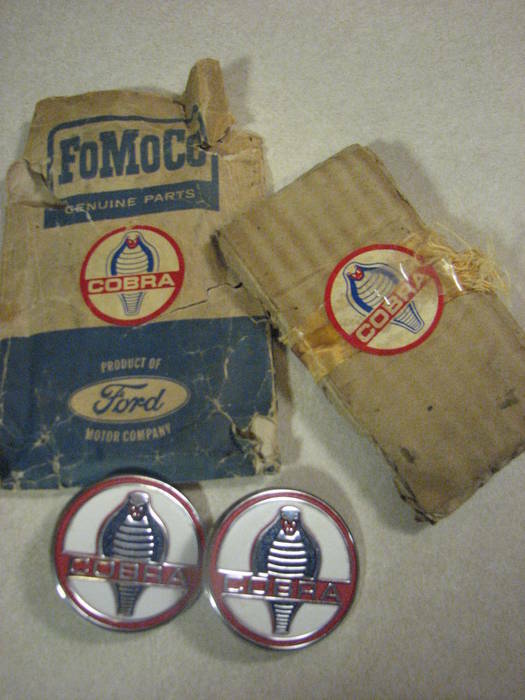 Example: S1CS-19523-C emblems and their package from a COBRA accessory kit. The push nuts are still packed in the inner pack. Decades ago I became aware of a couple of Mustangs that got dealer installed 2-4V COBRA induction kits as new cars. 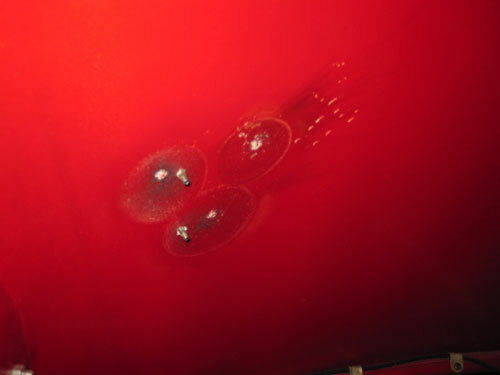 The corroded old emblems on the cars were like your S1CS-19523-B 2nd Version. Early 1963 Cobra mascot emblems installed on 1965 model year Mustangs. Not a big surprise I guess as there is no telling how much time it took for Dearborn Steel Tube to gather parts, put together kits, send the kits to Ford’s parts distribution network, and wait for somebody to order them. Later assembled kits came with the next design and before Total Performance® was shut down the C3RA-A emblems were included in kits. The "S1CS-19523-B Emblem, AC_Cobra 2 9/16" - as contracted by Mr. Shelby locally legend says and used on most west coast cars prior to at least CSX2133. A key feature of this part family was the new design had to be large enough to cover the holes in the coachwork or damage to paintwork left by removal of mascot emblems installed by AC Cars. The reason was simple, to eliminate the need to do metal and paint repair before installing S1CS-19523-B emblems where AC Cars mascots had been previously. There are three "original versions" of this part. The series started with smooth chrome plating and a rounded exterior edge, next was sharp corner exterior edge with brushed satin chrome plating, and finally a return to smooth chrome plating but this time the outer edge was left much sharper than that of the first version. Both the second and third versions were available as service parts well into 1968. ”Ford C3RA-14225-A 2”. The C3RA-14225-A part was produced in a single cavity permanent mold by one of FoMoCo's trim suppliers at the time. It replaced the S1CS-19523-C part during 427 Cobra production and became the service part for all Cobra cars eventually. The 1965 dated parts list contains production parts for both leaf spring and coil spring cars. Its last update was 05/31/65 and the C3RA-14225-A version FoMoCo commissioned is not in the parts list at that time. The earliest printed information I have found on the C3RA-14225-A 2" FoMoCo emblem was the SHELBY AMERICAN PARTS BOOK dated December 23, 1966. The end of 1966 catalog does not mention the S1CS-19523-A, -B, and -C emblems. The late 1966 book indicates the C3RA-14225-A emblem is for "64/66 ALL 289/427" ["Roadsters"]. The November 1968 catalog just for Cobras and 427 Cobras lists the 2 -9/16 emblem as an "accessory" and the C3RA-14225-A emblem for "ALL 64/67" Cobras. As far as I know the C4OZ-19D531-A COBRA medallion kit containing two each C3RA-14225-A emblems and four each push on speed nuts was the only two emblem “kit” Ford sold separately. Thanks Dan, I was sure you knew the answer. You are welcome. The S1CS-19523-B 2nd Version parts were (still are) the most environmentally fragile emblems installed on new Cobras. The brushed satin finish has very little resistance to water standing in the background detail or high humidity. Even new old stock ones stored in a home for decades can develop blisters in the plating. The 'pot metal' in them is low quality and it will corrode easily, quickly, and deeply if not protected from the elements. I have never found or seen a picture of a S1CS-B original version not on a Cobra. There must have been large numbers of the second version made before somebody decided to stop using them on new Cobras as in relative terms they are still plentiful in great new old stock condition. The third version is relatively speaking pretty rare. Shelby American sold second and third versions concurrently at least into 1968. I have two pair of emblems that Cobra owners purchased for their cars in 1968 and they never installed them. The reason both owners gave me is that Shelby’s parts department sent them two different versions. One man still had his invoice and the emblems were still in the wrapping they were shipped in. What each owner received was one each second version and one each third version. Neither wanted to install mismatched emblems so they didn’t. S1CS-C emblems are rare in any usable condition or any condition that can be repaired. 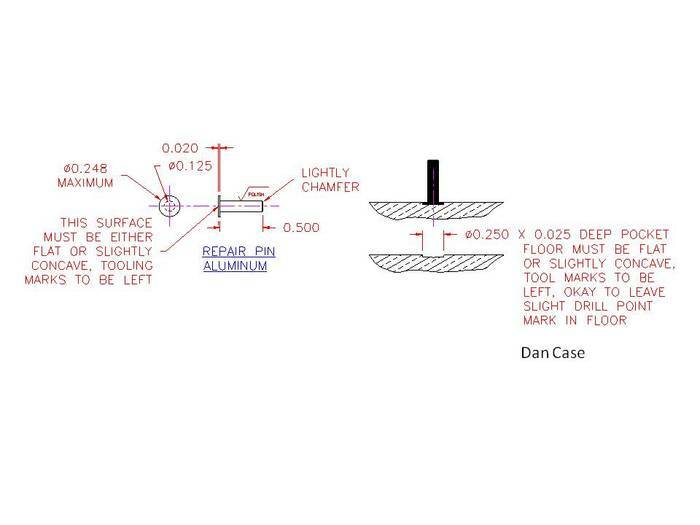 Used parts with missing pins is very common. I designed a fixture to clamp parts for doing machine work for new pins. I repaired all the ones with a pin issue I had. The two best repaired emblems are on our red car. Thanks for the great response. It made for great reading. It is the type of reply that demonstrates the quality and quantity of knowledge that resides within the SAAC forum members. An excellent teaching moment. Based on the reply times, you must be one fast thinker and typist. And pics was just the icing on the "cake"
I finally received my S1CS-19523-B cobra medallion from the seller. It's in surprisingly nice shape, considering what you said about the metal oxidizing. There is evidence of it on the surface, but it's limited and the colors don't seem to have been affected. What did surprise me is the size of this thing. It dwarfs the S1CS-19523-C emblem. I'm sure that was to cover the existing A/C badging you mentioned, but still. Check out the pic I attached for comparison. I just assumed they were comparable in overall size. Here's a great example of the holes and emblems. This is a very early unrestored Cobra. When the car was completed the "AC" script emblem installed by AC Cars was replaced with a S1CS-A emblem. Changing emblems meant filling old holes and making some more. They were not concerned with what the underside of the boot lid looked like apparently. An old image of my type set of Cobra emblems. Top row second from left is a large AC script mascot emblem. That would have been the type on that boot lid before it was changed out in the USA. Since this picture I have obtained an original owner's tag. Your small emblem is the C3RA type but the size comparison is valid. Dan, you're right, I just grabbed it for comparison. Thanks again for posting all that wonderful knowledge about Cobras. There really isn't a lot of it on this forum, so I speak for many when I say how appreciative we are to learn more about these wonderful automobiles.